One of the awesome things I get to do in this season of life is lead a group of amazing women as I volunteer with Proverbs 31 Ministries On-Line Bible studies. I can’t even begin to describe what an honor and privilege this is and has been. I tell you this because we are studying the book, Limitless Life by Pastor Derwin L. Gray. Highly recommend this book. In Chapter 5 of the book, titled, “From Damaged Goods to Trophy of Grace,” Pastor Gray speaks of the Samaritan woman on her way to Jacob’s well, where Jesus was waiting for her. Did you get that….Jesus was…..waiting…..for…..her!! If you’re not familiar with this transforming story, you can read it in the Bible, John 4:1-42. You don’t have a Bible? That’s ok, there’s an app for that!! Don’t have a smartphone? That’s ok, you can seek and you will find the story on the World Wide Web. Me: I know that someday I will have to bow before God and explain my failed marriage to Him because I sinned against Him. The part where her father said to her “what failed marriage?” sent a resounding thud in my soul. It was like the light bulb finally clicked on and I could finally exhale all the limiting labels I had put upon myself from my failed relationships. By truly breathing in the great forgiveness extended to me by the shed blood of Jesus I can take those chains and break free of the labels I’ve worn for far too long and put on the love labels God has for me!! Not from anything I could ever do, but because of what His Son already did for us on the cross. 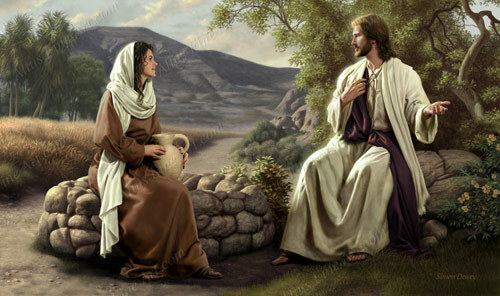 After Jesus has this transforming conversation with the Samaritan woman, she ran home to proclaim the word of Jesus and what He had done for her. Her shackles were freed and because of her testimony many Samaritan’s came to believe in Jesus!! Hallelujah!! As a believer in Christ, I have a responsibility and that is, share what God has done for me, just as the Samaritan woman did. If I walk around all wrapped up in the sins that have been forgiven, then what kind of love am I showing the world? Certainly not a Savior’s love. Fast forward to a little morning loving conviction from my Daddy: Hebrews 6:4-6 says: “It is impossible to restore the changed heart of the one who has fallen from faith—who has already been enlightened, has tasted the gift of new life from God, has shared in the power of the Holy Spirit, and has known the goodness of God’s revelation and the powers of the coming age. If such a person falls away, it’s as though that one were crucifying the Son of God all over again and holding Him up to ridicule.” Ohhhh, let me just say….OUCH!! So why, when I have tasted the gift of new life, would I go back and put on the sins of my past? The very ones God has already forgiven…I guess it’s because in this performance based world it’s hard for me to wrap my head around that kind of love. But that’s ok….because God’s not finished we me yet. I’m a work in progress and it took me a long time of living a sin-filled life to get to where I was…..but I am in no way, where I used to be…and that my friends is the sound of Amazing Grace!! Come to the well my friends, and drink from the Living Water, then go out and tell the world of all the glorious wonders He’s doing for you!